Art Nouveau was a highly decorative style, popular from approximately the 1870s to 1920/30s. The name comes from a famous Arts shop in Paris called La Maison de l'Art Nouveau. Art Nouveau is characterised by its use of detailed decoration, usually of an ornate nature. Art Nouveau relied on traditional craft skills, especially through the use of elaborate wrought iron scrolls. A sample of the type of decoration used in this type of work is seen below. Art Nouveau was popular in Victorian times. Very good examples are still to be seen in Victorian houses and mansions. This type of design work is also to be seen in the glasswork of the same era, interior design. Jewellery of this style was also popular. The interior of an ornate roof and a staircase are shown below. These are good examples of the Art Nouveau style. Ornate wrought iron work dominates both samples. The Art Nouveau style was also applied to interior decoration and furniture. The lamp shown opposite clearly displays an ornate design. 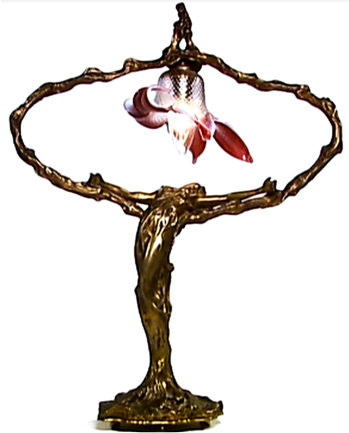 It incorporates a female figure, also a characteristic of Art Nouveau designs. Art Nouveau artifacts were fashioned / manufactured by highly skilled and workers. They shaped materials such as wrought iron, glass and jewellery, using traditional techniques. It took years to train craftsmen in these fields and often Art Nouveau artifacts were hand made. Consequently, Art Nouveau was the preserve of the rich. Most Art Nouveau furniture was manufactured in factories or workshops, as ‘one offs’ or as a limited batch production. Consequently, products of this style were expensive and out of reach of the average person. The Art Nouveau movement became very popular through the world, although its origins are to be found in Europe. This style is much less fashionable today, as design has move on. The general public are more educated in design and what is fashionable. Simple, functional designs are much more popular today, compared to the complexity and ornate nature of Art Nouveau.